To book dates, click on “Book Now” and select the date range you would like to book below. Balance due 90 days out summer; 30 days winter. 10% cancellation fee prior to 90/30 days. No refund after 90/30 days. We strongly advise travel insurance for your contingencies. 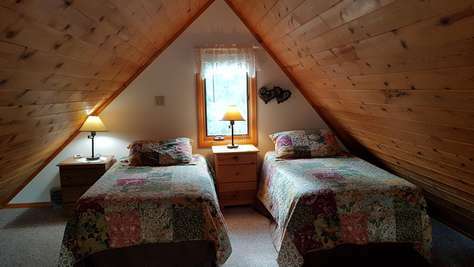 Bedrooms: 2 Bedrooms, Sleeps 9, Beds for 7-9. This property has 4 Twin(s), 2 King(s), 2 Queen(s). 10% cancellation fee prior to 30 days. No refund after 30 days. 50% down to book. Balance due 90 days out summer; 30 days winter. The chalet was outstanding in location, accommodations, condition and space! There was something at the cabin/in the area for everyone in the family! From the adventure-seekers to the hot-tub soakers! Gary was very accommodating, and we thoroughly enjoyed our stay! It was a great place to enjoy Alaska with the conveniences of home 🙂 There was even a CROCKPOT in the kitchen!!! Highly recommended! Three levels of fun and relaxation, and the hot tub with an awesome display of the Northern Lights was a highlight. The views from the windows upstairs are magical. I came away feeling like I wanted to live there. The driveway is a bit steep and there is a jack-knife turn to get up to the cabin, so if you have a big truck, good luck. We will be making this a family holiday tradition. I am a travel agent. 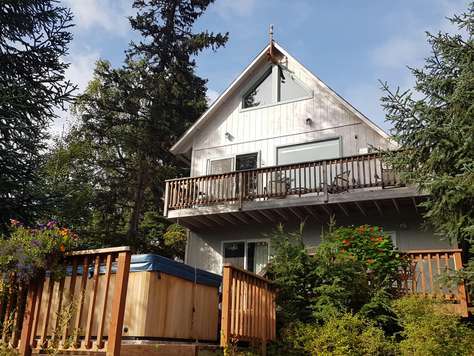 You will not be sorry for booking this chalet in Moose Pass - only 30 min north of Seward. Nice, quiet setting with unbelievable views, specially from hot tub. What else can a person ask for! The owner has 3 rentals, this one is the oldest, but has a perfect floor plan to enjoy the views. If I could, I would add a couple pictures, but don't see an option to add any. The house was spotless and huge. We are a family of 5 and had plenty of room. Separate living areas on the 1st and 2nd floors give everyone the space they need. The house is well equipped. Importantly, bottled water (water cooler) is provided which is fabulous as the sulfur smell of the water is tough to deal with. 8 gallons were provided for our 3 night stay which was more than sufficient but more was available had we needed it. The view is just as pictured. Absolutely gorgeous. Th house sits on a hill above the Seward Highway so there is some traffic noise but it certainly isn't an interstate as there are only 2 lanes. 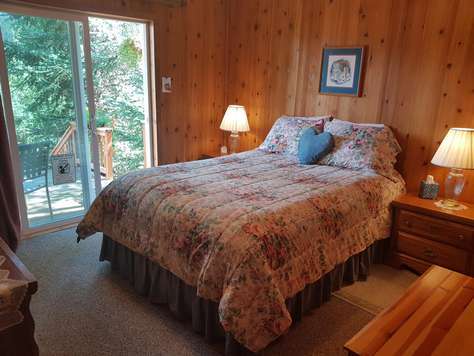 Access to the pristine lake is right across the highway and down a short steep embankment. The on-site property managers met us for check-in, showed us everything we needed to know and were extremely helpful setting up a generator when there was an area wide power outage. They were available by cell our entire stay. We used this house as a home base for day trips to Seward which is 28mi away. The ride there is beautiful and quick. The town of Moose Pass itself does not offer anything to travelers other than a motel and super small convenience store (no gas) but that was fine with us. The house is in a group of 3 homes all situated so that, while another home is visible, you really feel like you are removed from the world. 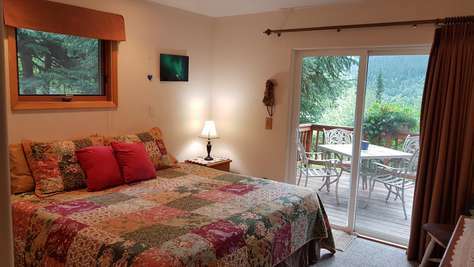 We would love to come back to Steller Jay and recommend it 100%. The chalet was great! My family of six needed a comfortable place to enjoy Alaska and this chalet was perfect. It was so beautiful! The view of the lake and trees from our chalet was gorgeous. It was relaxing and was an easy drive to Seward for the excursions offered there. My husband and I would definitely book the chalet again for a longer stay! Really enjoyed our stay!! Very clean, beautiful view and the hot tub was a hit. Owners were very nice and helpful as it was a last minute valentines getaway for my family. Definitely would like to come back, maybe this summer for some fishing! We had such an amazing time. The Stellar Jay was perfect for our Family. We brought our 3 kids and my mother in-law. The jacuzzi was so awesome, we had a perfect view of the Northern Lights. It was cozy but plenty of room for everyone. The first of many trips! As always the chalets that Spruce Moose offers were excellent and fulfilled what we wanted with a semi-secluded Christmas experience in the woods. The view from the hot tub of the lake and mountains is majestic, calming and all that Alaska has to offer. 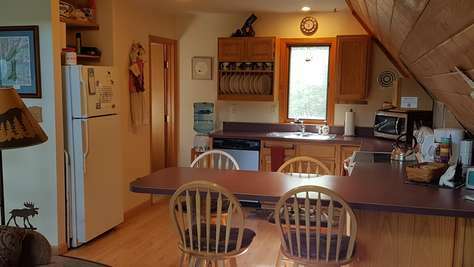 The chalet has all the amenities one could want, plus some, it's well stalked with utensils and supplies and is well maintained. We thoroughly enjoyed our stay and will be returning again, as we continually do. Five stars all the way, couldn't recommend these chalets more highly. We were very impressed at the view!! Then we were very impressed at how clean everything was. We stayed at the end of July for 4 nights, the Stellar Jay was convenient for us doing our excursions to Seward, Cooper Landing, and Soldotna. The beds were very comfortable as we had all stated we slept our best on vacation at the Stellar Jay. Gary and Treva really thought of everything from fire wood to directions with soap for the washing machine. It was wonderful to have drinking water along with the dispenser as the water from the tap had a different odor due to the sulfur (I believe). Gary and Treva gave wonderful directions on using anything in the house. And the view to wake up to that in the morning and have a fire by it was amazing. This is our first VRBO and because of the wonderful experience I would do it again. I would recommend the Stellar Jay or renting anything from Gary and Treva. We stayed at the stellar jay in mid July for 3 nights and had a delightful time. Gary and Treva were great hosts and even left a dessert in the fridge for us. The cabin is very nice and sports a wide screen TV plus good satellite service. The internet connection was pretty reliable too- not a given in Alaska. Pots pans and utensils were plentiful and pretty good. The tap water does have a bit of a taste to it but the hosts provided drinking water and a dispenser. We cooked with the tap water and noticed no taste. The cabin is up on a hill and is near the hosts other two cabins but far enough for ample privacy. We barely noticed renters in the eagles aerie. Loved the hot tub and fire pit too. Beautiful cabin and great set up for families with children. The hot tub and views were amazing! Owners were very professional and helpful during our entire stay. We look forward to returning again. Thank you! This perfect cabin was available for a short notice retreat after our camp out of state was cancelled. Close to Seward, and any other adventure we chose, we greatly enjoyed the quiet, private space. We LOVED being able to use the fully functioning kitchen!!! The stairs were a small concern due to the babies we brought, but we were easily able to corral them downstairs or in the living room area. The hot tub was a huge perk also! We're very grateful for the kindness and quick response of our hosts. Our retreat would not have been the same without!! While we were on go during our stay in Alaska every day, it was nice to come back and relax and enjoy the scenery and the hot tub at the Stellar Jay chalet. Five of us fit very comfortably with my two daughters occupying the loft, my son in one bedroom downstairs and my wife and I in the other bedroom downstairs. Two showers also helped. Nice touch with French toast prepared by Gary's wife in the fridge on our arrival. Highly recommend this chalet. Great location, fantastic view, clean and comfortable home and the best-stocked kitchen we've had the pleasure to cook in during a vacation. Gary was very hospitable and easy to work with. We had a wonderful time at the Spruce Moose Wild Rose Chalet. It was absolutely beautiful inside & there was a stunning view of the mountains from the Chalet. The hot tub was great after a long day of hiking. Can't wait to come back again! We absolutely loved our stay at the Spruce Moose Stellar Jay Chalet. The cabin was clean and super cozy, the full size kitchen was so nice to have and the VIEWS!! omg! the views were just breathtaking specially from the hot tub! Mr. Gary was super sweet and helpful specially when I booked the wrong chalet and he had no problem on switching the reservations! We will definitely be staying with them again in the near future! Highly recommended! We loved the March week we spent at Spruce Moose Steller Jay chalet! We are Alaskans but came down to meet with out-of-state relatives. No snow but Upper Trail Lake frozen and smooth, so plenty of skating and hiking. Our chalet was clean, well-furnished and the full-size kitchen was a major plus, as was the magnificent view from the hot tub in sub-zero weather. 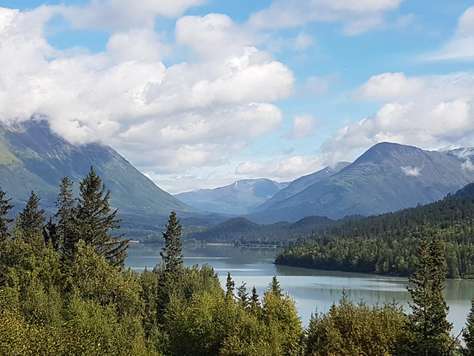 We drove to Seward for shopping and the Sea Life Center, but loved the immediate access to amazing recreation literally right out the door in Moose Pass.